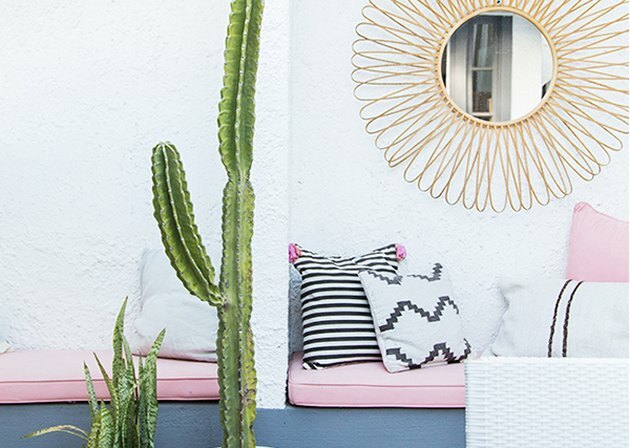 If there's one thing we've learned about millennial pink — you know, that muted rosy shade that's pretty much a staple of its namesake generation's sense of style — it's that it looks good on pretty much everything. From furnishings to fashion, this is a hue with the type of versatility that's akin to airy marble and sturdy leather. Plus, it has stirred up quite the loyal following. That's why this particular patio's look is so alluring. 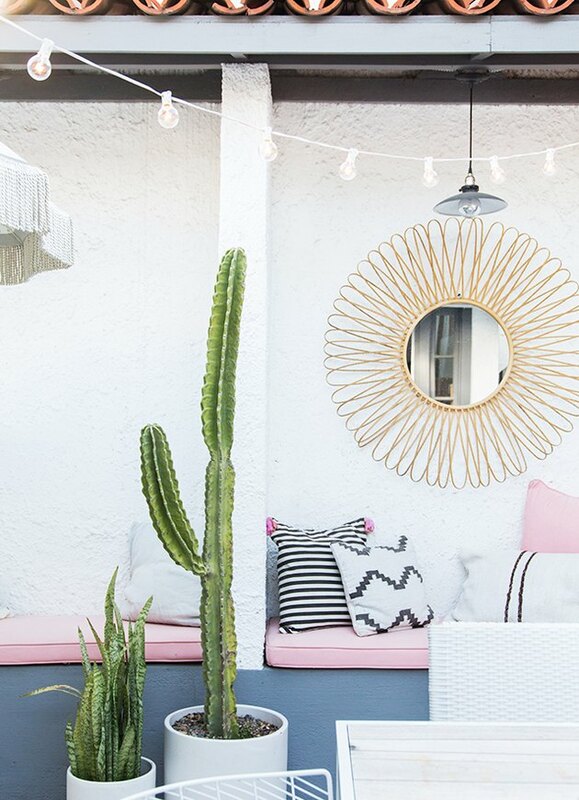 Crafted by interior designer Sarah Sherman Samuel for fellow creative Bri Emery's home, this outdoor space uses the buzzed-about shade in a palette that's still timeless. Sure, at first glance, everything appears entirely of-the-moment. Triangular gray-and-white tiles spread across the floor under wire and woven chairs surrounding a wooden dining table. Then, the blush hue appears as bench cushions next to printed pillows, and sunburst mirrors overhead give the effect of a living room. 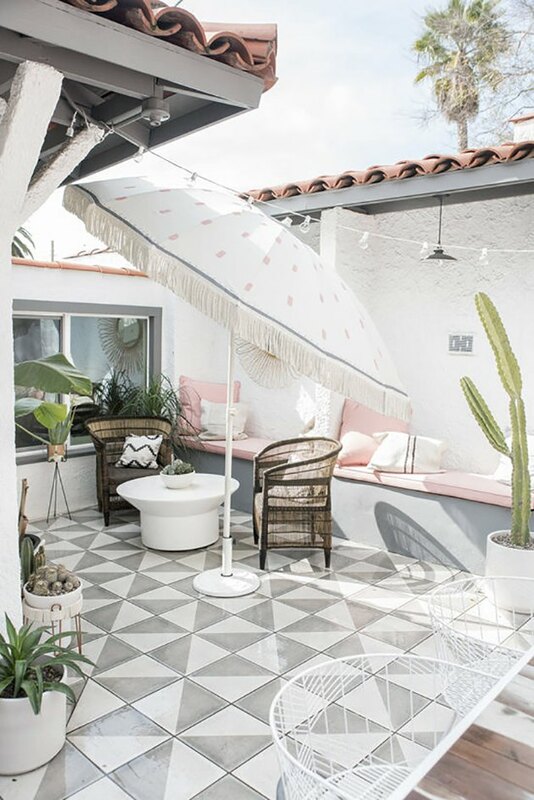 Lastly, a fringed umbrella and strings of light add dimension alongside succulents and cacti, making for a cabana-like aesthetic that's cheerful and chic. But what keeps this design outside the bounds of changing trends? The look's cool femininity provides stylistic weight, since the splash of millennium pink is paired with gray, white, and black. If you were to emulate this vision in your own home, that balance of a bright, popular hue with classic colors is a guaranteed way to keep the space looking good for summers to come. White woven chairs from World Market ( $179.98 ) are coupled with matching wire arm chairs from All Modern ( $480 ). 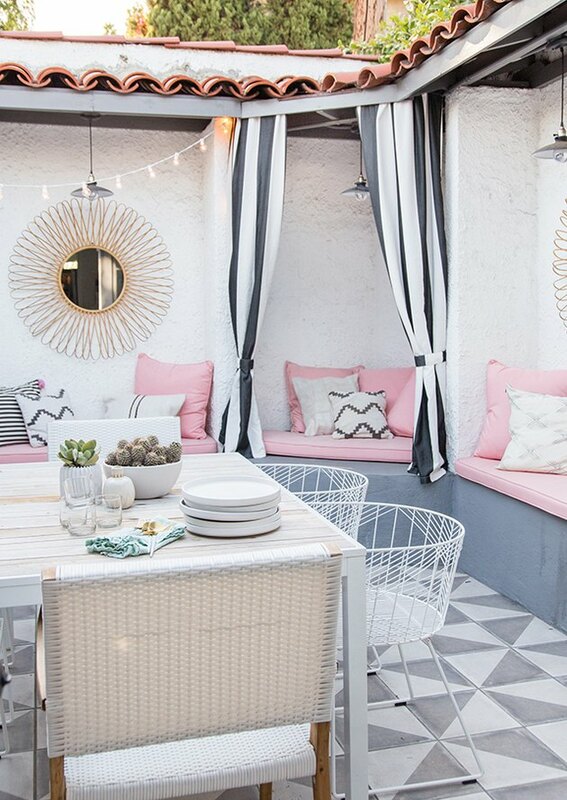 Black-and-white striped curtains from Pottery Barn ( starting at $139 ) give the built-in seating area a cabana-like aesthetic. The pink cushions and pillows were custom-made from durable fabric by Patio Lane ( $24.21 a yard ). A zigzag pillow ( $39.95 ) sits under a starburst mirror ( $79.99 ), which are both from CB2. 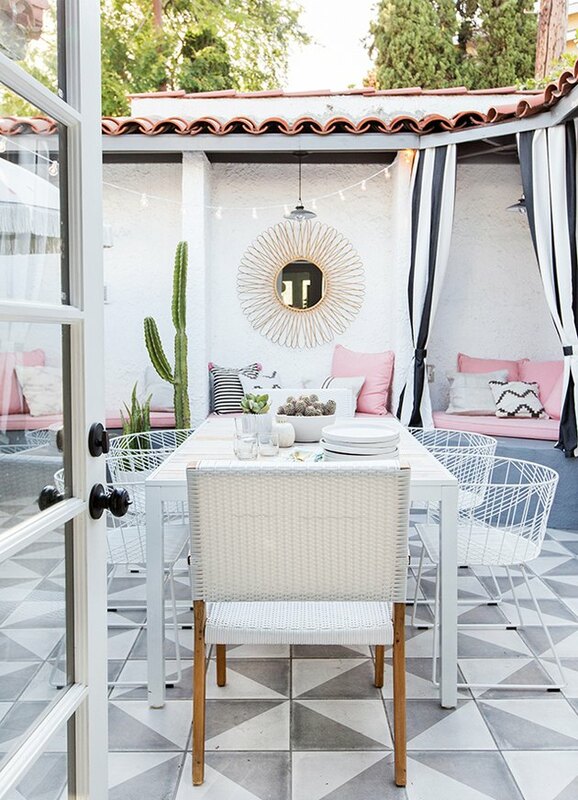 Woven chairs from CB2 ( $399 ) are arranged under an umbrella that homeowner Bri Emery created herself. Greenery is a major design element in the space, and it adds height and color to this corner. 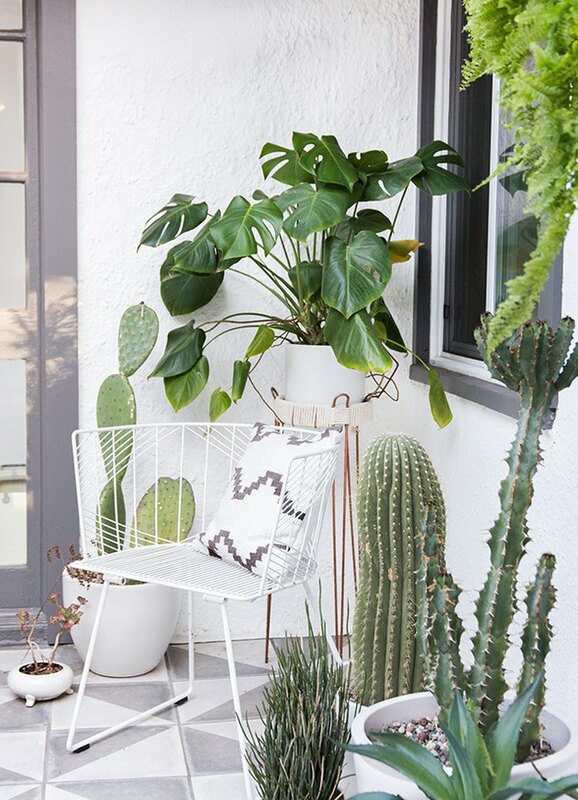 Designer Sarah Sherman Samuel made the copper plant stand behind the chair.